The seventh novel from Whitbread winner Rachel Cusk is in many ways the epitome of a minor work. It examines mediocre characters living mediocre lives, constructing around them a narrative structurally analogous to such content: muted, conservative, quiet. What makes it not only Cusk’s best work to date but also one of the most engaging British novels of recent years is the extent to which the author commits to the insipid, the domestic, the mundane. If Virginia Woolf had gone for a jog everyday instead of smoking so much, she might have written The Bradshaw Variations (though this is still strict realism, much more Night and Day than The Waves). In an age where the likes of Zadie Smith and David Mitchell get all the hype, there is something refreshing about Cusk’s well-wrought traditional approach. Here are middle class fundamentals: work, family, and the omnipresent wild blue yonder which threatens to destabilize everything we build, be it in the form of a piano fugue or an ephemeral brush with a fellow commuter. Cusk’s minimalism challenges the sturdiness of our interiors, extremely sensitive to revealing and rendering every crack. 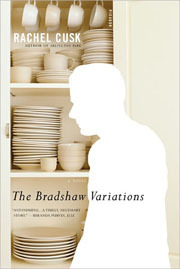 Normalcy is one of the central concerns of Bradshaw; the author neither deflates nor champions the notion, but rather analyzes it with terse precision. What is normal, what effect does the specter of normalcy have on our lives? Guy Debord wrote “I have most certainly lived as I have said one should; and this was perhaps even more unusual among the people of my day, who have all seemed to believe that they had to live only according to the instructions of those who direct current economic production and the power of communication with which it is armed.” Cusk evaluates various frameworks of “instructions,” with particular interest in what is left over after we give ourselves up to the various endeavors that formulate a life. She seems to search for the individual, for the character herself, embedded somewhere in a busy modernity. At the heart of the novel, we witness a character shedding the accessories of that modernity and reaching, equally full of fear and exuberance, for something eternal. Rachel Cusk has done the same.